From wireless connectivity and embedded devices to software and sensor options, there are countless considerations to weigh before planning out your Internet of Things (IoT) solution. How do you know where to start, or if you’re even ready for an IoT solution deployment? 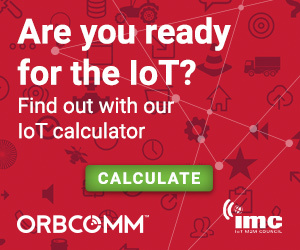 ORBCOMM has partnered with the IoT M2M Council (IMC) to develop a new IoT Readiness Calculator designed to help prepare companies for deploying connected devices in the field. The IoT calculator surveys users about their business requirements as well as technical issues including security, latency, integration and scalability. The survey tool also compares the results with the respondent’s industry peers to provide a scorecard for an even fuller picture of IoT solution readiness. The IoT Readiness Calculator includes some fairly sophisticated algorithms to determine the individual score for a user’s planned IoT project, and then shows how that project stacks up to others in the same field. The users receive an email with their scores, as well as indication of where they need improvement, and advice on solutions providers to contact. The calculator is an invaluable evaluation tool at the outset of any IoT project, that will ultimately help ensure quick and efficient solution deployment while meeting business and end-user requirements. IoT Readiness Calculator respondents receive a scorecard comparing them to their industry peers for an even fuller picture of IoT solution readiness. The IoT Readiness Calculator is a valuable complement to ORBCOMM’s IoT Toolkit, which provides every layer of the IoT stack required to develop market-specific solutions that improve asset utilization, reduce operational costs and provide long-term return on investment (ROI). ORBCOMM’s IoT Toolkit components, including devices, IoT connectivity services, subscriber and device management, application enablement platform, as well as cloud-based SaaS reporting applications, are available together or separately to enable customers to create M2M and IoT solutions with the assurance that all of the building blocks are interoperable and come with a single point of contact for end-to-end support. For more information, visit http://www2.orbcomm.com/iot-readiness or email sales@orbcomm.com.